Here at Frugal Follies, we love giveaways. Giveaways are a great way to get something for free! I love to run giveaways (click on Giveaways at the header to find them), and I love to find out about other giveaways (many are listed on Frugal Follies Tuesday, also listed above). And I love to enter giveaways. One problem that I sometimes find with entering giveaways is that it's hard to keep track of what giveaways I've entered. And I tend to only enter online giveaways, when there's a whole world of giveaways offline as well. So I was very interested to learn about iWinnersAdvantage, a site where you can learn about online sweepstakes and contests as well as offline ones! 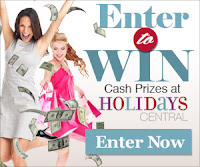 At this site, you'll not only learn about giveaways both nationally and internationally, but you'll also be provided with a free area where you can track your entries and winnings. You can browse the contests or search for exactly what you want to find. And you can not only win things at iWinnersAdvantage; you'll also learn about freebies. And there's also a discussion board to share your love of giveaways with others. So if you love giveaways as much as I do, definitely check out iWinnersAdvantage!